The man I love has one particular quality which I admire and value more than I thought I ever could. He’s able to laugh at himself. Quite effortlessly, in fact. Maybe this isn’t a big deal for some of you but for me, it’s really up there. I am not very good terrible at laughing at myself. I pride myself on having a good sense of humor but there are just certain things I don’t find funny. I was never one of those who appreciated practical jokes or prank calls, especially if I was the recipient. And I’ve been the recipient. One of the traits I always loved about my brother when we were growing up was his ability to make me laugh when he was making fun of me; I held this in the highest esteem, of course, because I didn’t like poking fun at things I said or did. It’s always made me feel as if my flaws were on display and I could just never lighten the hell up about it. I think that’s why even now, when someone goes out of his or her way to try and make another person feel stupid, I get really defensive, whether it’s myself or not. I’ve always valued any person’s ability to have patience and explain things if I (or someone else) doesn’t know something. Nonetheless…one thing that will get me in hysterics every time is physical humor. Specifically, people tripping. Kevin is the first person to admit that he’s klutzy, and most of the time, it’s endearing. The best part about Kevin being clumsy is that he takes it all in stride and doesn’t stress out about it at all. Me, I fret. I’m constantly wringing my hands and telling him, “For the love of God, be careful!” He just laughs and shrugs his shoulders. I so wish I could be like that when it comes to myself. I’ve had several people in my life make fun of my pronunciation of certain words. I think it’s when I get particularly Midwestern and say something with a classic nasal A or E sound. I have a friend who was in absolute hysterics listening to me order a “lamb sandwich on a pita” in NYC one day. I’ve never heard the end of it. I still don’t get it. I’ve laughed along as best I can but I seriously don’t get it. And it’s not one of those, “You had to be there” moments because I was there. I can “heh” a little bit that she finds it so hilarious but since I don’t understand where in my pronunciation I went wrong, I can barely crack more than a confused smile. It’s in those times that I want to channel Kevin and just bust up laughing with everyone else. I think he’s a good influence on me, though, and I get the biggest laughs when we’re teasing one another at home about something or other. I like to impersonate him in different voices which always ruffles his feathers a bit but he’s such a damn good sport about it, so I never stop doing it. I’m in stitches every time! Little side story: when we were first dating and Kevin was learning about my likes and dislikes, especially when it came to food and cooking, he told me I was a really picky eater. At first I was kind of appalled, because I never considered I was picky, just someone who had very particular taste. (I know. Denial.) Over time as we’ve lived and grown together, I have to admit he was right and I don’t know how I ever thought I wasn’t but I am one picky mofu. For those of you wondering what the BFD is, they’re diced peppers. Diced! I have a thing with veggies where they have to be diced in order for me to eat them with gusto. Otherwise I’ll just pick at them. I know it sounds so oddball but anytime I’m given a salad and the veggies are in big slices or chunks vs. nicely quartered or diced, I never finish them. That includes lettuce leaves, usually, as well. But with this? I managed to eat the entire 6 oz. 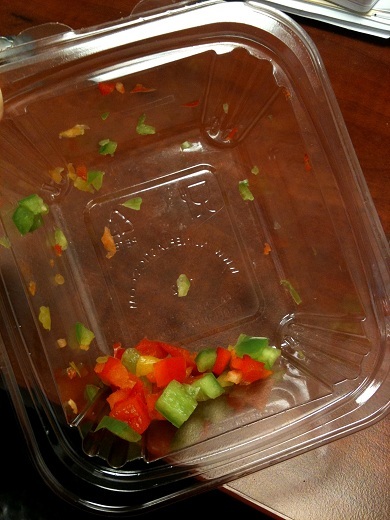 container with NO salad dressing as I ate my chicken lunch. This is a proud moment in Zoe history, I’m just saying. And I know that this is weird, I know it’s funny, and I feel good about laughing at myself. It’s progress! Kevin will no doubt shake his head when he finds out since I still eat vegetables like a five-year-old but hey, whatever works, right? I don’t know if I’ll ever get to the point where I can laugh at myself when everyone is staring at me after a particularly embarrassing moment, say, if I tripped. But let me tell you. There is no stopping the mirth from flowing when I see someone trip and just completely bite it. I just CAN’T HELP IT. I will – between gasps of laughter – ask the person if s/he’s okay, of course. I’m nice like that. And I so wish I weren’t a hypocrite on this one but it’s never funny when I do it and always funny when someone else does it. No matter what movie it is, if someone can pull off a successful natural looking trip, I will crack up. And so, if you’d like to join me, this YouTube video has some of the best physical trips I’ve seen in a long time. Favorite moments: waitress, hurdling, Mercedes honking. « Arachnophobia or just being a girl? You have me laughing my head off right now! Way to go Zoe! oh he reminds me of me. You must be a great fan of chopped salads! I really am!! Best invention everrrr. Wow. Yeah that’s pretty embarrassing but so classic for the first day of school when you’re new! Great laugh-at-yourself story. I never, never, never laugh at anyone who falls or trips when it happens…but later when I’m alone and no one’s feelings will get hurt I can laugh for a good 10 minutes. Haha. Falling. You have more self control than I! But yes, typically I will laugh to myself in private more than just be rude about it. My family still laughs to tears about the time as a kid I tripped walking up the front steps of a restaurant with my hands in my pants pockets. I had no choice but to play it up and lay there face down flapping my elbows like a beached seal. Diners inside were reportedly choking on their food at the sight. The ability to pull off a good pratfall is priceless.